Our Lady of Lourdes - My Catholic Life! 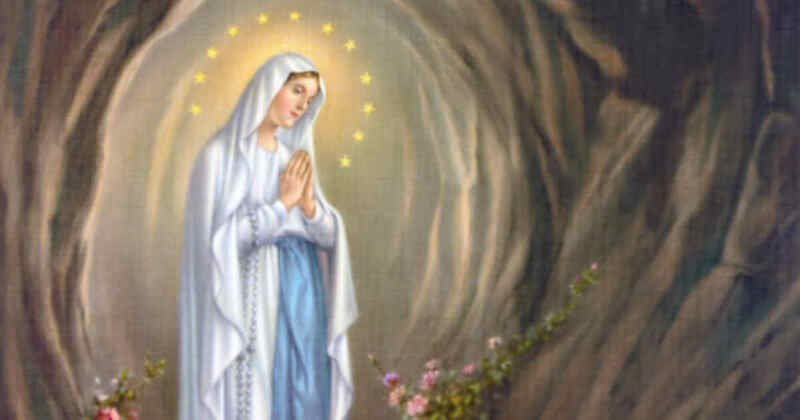 In 1858, 14-year-old Bernadette Soubirous told her friends that a beautiful young lady was appearing to her in a rock formation on the outskirts of her small town of Lourdes. A friend asked Bernadette to do her a favor—to take her rosary along the next time she knelt before the beautiful young lady. Bernadette obliged. Later, Bernadette told her friend how the lady had reacted: the lady had noticed that Bernadette was not holding her own rosary, said that she was not there to make relics, and told Bernadette to return next time with her own rosary, not someone else’s. In addition to the miraculous cures associated with the healing waters of Lourdes, the very character of Bernadette, as well as the tone and content of her accounts, removed all doubt that the beautiful young lady she saw was indeed the Virgin Mary. Our Lady of Lourdes is perhaps the most powerful and prolific physical healer in the history of the Church after Christ himself. Through her intercession, and through the waters that flow in her magnificent shrine, many thousands have been cured of their infirmities, as medical records prove beyond any doubt. Holy Mary has appeared at various times and in various places, but mostly to the simple and mostly in the country. She loves the faith of the simple, and speaks to them in simple language. In this, Mary reflects the words of her Son Jesus. He speaks plainly. His message is clear. And Mary’s simple words always point to the simple words of her own Son. God is like the sun whose fiery brilliance scorches the eyes of all who look right at Him. Get too close and you’ll be burned. Like the sun, the Creator of the world can be distant, mysterious, and intimidating. But Mary is like the moon, bathed in a soft, pleasant glow. She’s close to us, and easy on the eyes. The sun’s heat and light may make life possible, but the sun itself is dangerous and remote. But Mary can be approached by man. And like the moon, she doesn’t produce her own light, but just reflects in a softer tone the powerful rays of the enormous star whose light generates life itself. 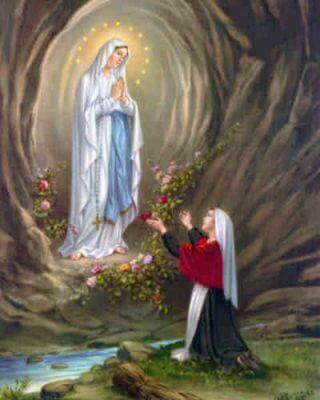 Our Lady of Lourdes, give physical healing to all who invoke your intercession. The saving waters at your shrine have healed thousands of pilgrims. May all the prayers and supplications directed to you be immersed in the waters of your holy baths, so that what is asked may be granted through your intercession and according to God’s will.